Darxide is the most expensive 32X game. The game is very rare and recently sold as part of a collection of other 32X games for $948 (GBP 623). The other items in the collection weren't anything really expensive so the vast majority of the bid price was for Darxide which with my estimates makes the game worth about $700. Luckily for collectors, there is a second copy on ebay right now that is just the game. Within 9 days we will know for sure what the game is worth. The gameplay is very similar to Star Wars Arcade BUT much, much worse. According to Sega-16.com, Darxide "takes the simple, addicting gameplay of the Lucas Arts hit and screws it up, plain and simple." Game play isn't always important to collectors though or else Bubble Bath Babes, Hot Slots, and Caltron 6 in 1 would be worth pennies instead of worth hundreds of dollars. Darxide sells for so much money because it is rare. Don't buy it if you want to play a great game. Actually Chaotix ain't so bad... Not £600, but definately £60 for a PAL one. My (horribly torn box) copy just sold for £62 (pending payment). Actually, the only other two bidders both bid £60.00, so I guess it's the going rate for one in a poor box. Have seen it around £150 in the past though. Plus the system itself should have made quite a bit, at least £50 I recon, not a great judge of these things (was offered a multi-mega when I got Chaotix, I went "errm... what? .. err.. £10?" not a clue. Me + retro = oh noes). @Christopher Knuckles Chaotix sells for about $20-30 in the USA. 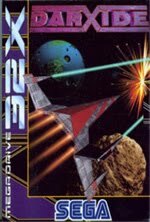 Definitely a fairly pricey 32X game but no where near as rare as Darxide. PAL Knuckles Chaotix and Kolibri are both rare and expensive 130-150 pounds!! Of course complete with no torn boxes etc Also I would never give 700 euro actually not even 300 for the condition Darxide has no matter the rarity. Its stupid.